Like most people, you probably think you have more influence over your life than you really do. Psychologists call this the “illusion of control.” It’s the reason most of us prefer to pick our own lottery numbers, than have someone else do it. And it’s why we think we’re less likely than average to suffer unwelcome fates from illness to insolvency. This illusion of control also extends to the way we view other people’s lives. The stories we hear about successful entrepreneurs, artists and athletes, usually make it sound as if they got there purely through talent and hard work. What’s missing in this analysis is an appreciation of the importance of chance. A rarely talked about population of equally hardworking, talented individuals massively outnumbers the famous high fliers. Perhaps you are one of these hidden strivers. What is one of the main differences between you and the super elite? Luck. 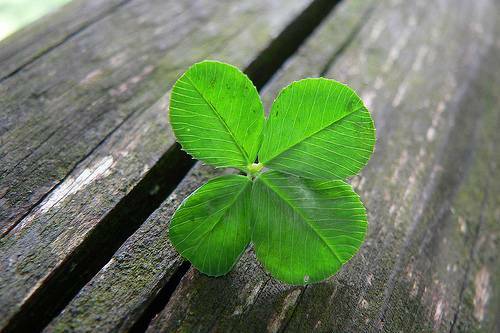 To say that luck plays a significant part in success can seem demoralizing at first. However, once this is acknowledged, you can put systems in place to protect against bad luck and capitalize on the good. But first, recognize that there are two kinds of uncertainty in life and each requires a different strategy. As Professor of Decision Sciences Spyros Makridakis and his co-authors explain in Dance With Chance, Making Luck Work For You, the first kind of uncertainty refers to those probabilities that are lawful and measurable. For example, the more times you rehearse a presentation, the better it will be. Rehearsing does notguarantee a successful pitch, but there is a predictable relationship between practice and outcome. The other kind of uncertainty is completely unpredictable and game changing. These are the kind of events – positive or negative – referred to by the statistician and author Nassim Taleb as “Black Swans.” Black Swans are the hugely significant chance events that send your life down one proverbial fork in the road rather than another. The positive variety can transform a hardworking, talented professional into a globally renowned superstar. Managing uncertainty effectively means recognizing the limits of your control. You can influence those uncertainties that are known and lawful. This is where hard work pays off – in rehearsal, research and learning. The more time you invest, the more you raise your chances of success in a predictable fashion. But it’s possible this will only take you so far. Black Swans can bring you fame or failure, and they require a different treatment. By definition these events are unpredictable, but once you accept their importance, there are meaningful strategies you can adopt. To take a basic example, don’t invest everything you have in one product or venture because if it fails – and there’s a chance it might – you will be ruined. You can work for years on a painted masterpiece, but it’s irrelevant if your house suddenly floods, washing away your work. Just as financial investors diversify their portfolios, consider whether you can offset risk by balancing your creative projects. When it comes to positive Black Swans, you need to leave yourself open to good luck. This is where risk-aversion and over-planning can backfire. Imagine your future entrepreneurial success depends on finding a co-founder that complements your skill set. If you only speak to people you know at networking opportunities (and there is research showing that this is exactly what lots of people do), then you’re reducing the chances that the needed fluke encounter will ever occur. When you look back on events, it’s pretty incredible how things come together. Nothing happens independently. Everything is tied to something before it. Sometimes the links are more obvious than others, but it’s healthy to take a few moments to reflect on how many things – and people – had to come together in order for another thing to happen. Leaving yourself open to chance encounters of course runs the risk that you’ll end up talking to people you don’t like, but conversely you could end meeting the person who makes your career. It’s by deliberately allowing some risk into your life that you increase the opportunities for good things to happen. Other ways to leave yourself open to good luck include: accepting unexpected invitations, experimenting with new activities, improvising when you’re performing, and allowing room in your schedule for spontaneity. This isn’t about being reckless. It’s about making sure that you aren’t so over-focused, and your life so over-planned, that you fail to benefit from the best slice of luck that ever came your way. When we maintain a maniacal focus on controlling our careers and our projects we can easily let these potentially positive Black Swans whiz by without ever noticing. Preparing for the completely unpredictable sounds like a contradiction in terms. However, if you accept that completely random events are an important part of your career success, it leads to different decisions than if you assume everything can be anticipated and controlled. Makridakis and his colleagues suggest a technique known as “future perfect thinking.” It’s based on the idea that we find it easier to use our imagination when thinking about the future than when assessing the past. When looking back, we fall prey to hindsight bias – everything that happened seems like it should have been obvious. To perform “future perfect thinking” you first need to picture yourself at the end of your career as a penniless failure. Now use your imagination to think what are the events that occurred that resulted in this predicament. Perhaps you made a poor investment. Maybe you failed to protect the copyright on your work. The purpose of this thought experiment is to give you ideas for the kind of negative Black Swan events that you need to protect against. Of course you can’t predict exactly what these will be or when they’ll occur, but your ideas will help you devise strategies to make yourself more robust to unpredictable threats (Taleb calls this “anti-fragility”). Now do the same, but picture yourself at the end of your career as a billionaire, award-winning designer, or novelist (choose your own dream). Think – what are the events that occurred that led to this welcome state of affairs? Did you dream up an original idea while lying on a beach? Perhaps you changed career, relocated and retrained in a different field? Whatever – use these ideas to help see how to leave yourself open to good luck, and to check that you’re flexible enough to take any opportunities that come your way. Would you be ready and able to move if the chance of lifetime emerged on the other side of the country? You can’t always force success to happen. Often we need a little luck too. Embrace this uncertainty. Influence those probabilities that are predictable, and make yourself as flexible as possible to cope with, or benefit from, those that are not.